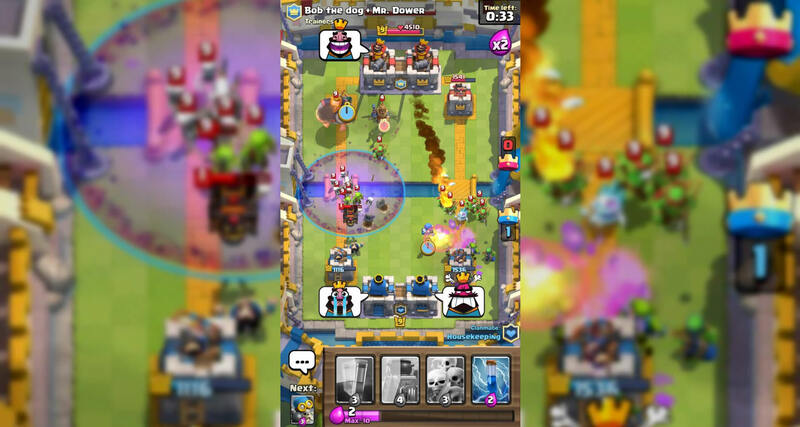 If you're one of the countless players who are still getting their fill of Clash Royale, developer Supercell's highly-addictive free-to-play mobile strategy game, then good news is on the horizon: as revealed during the latest Radio Royale podcast episode, Supercell are soon to release a new 2v2 gameplay mode for Clash Royale called Clan Battle. The new mode will see four players duking it out on a battlefield extended on the lower side by four tiles. While the same general rules will still be in play, a few tweaks to the gameplay have been made: both players will have 10 elixir bars, and the elixir will replenish 15% slower than the usual rate. Elixir Collectors won't be shared, either, but buffing cards will apply their effects to all battlefield units. The Clan Battle mode will be launching alongside a new game update that includes several other tweaks and improvements: the Clan Chest will be moved from Friday to Monday, cards will now have their own "Tournament Level" button to see their stats at Tournament Rules, and a new Legend Card called Bandit will be released. The Clan Battle mode as well as a few additional updates to Clash Royale should be going live on players' devices on March 24.